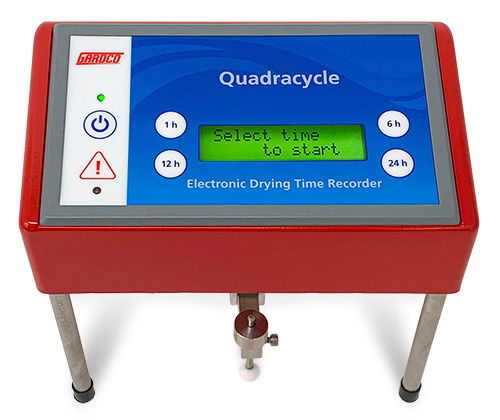 Drying Time Recorder which measures and records drying times of all types of coatings, adhesives, etc. The Drying Time recorder consists of a stepper motor mounted on a rubber tipped tripod. The arm and ball assembly has a counter-poised vertical stylus consisting of a Teflon 3/8 in. (10 mm) ball stylus and a counter weight to adjust to zero. The Teflon stylus typically under a 12g load (weight supplied) is moved in a 360 degree arc at a pre-selected fixed speed. A shaft arm with Teflon® ball scriber produces a 2" diameter circular path. Drying time is observed and recorded as the ball penetrates the film and produces a circular groove over a period of time. After drying is completed a clear plastic time template is placed over the area so that the drying time record can be converted into minutes or hours. Made by the Paul N. Gardner Co., Inc.
Teflon® is the registered trademark of E.I. DuPont de Nemours & Co., Inc. Attach the arm and ball assembly to the motor shaft by way of the hex screw. Once tightened to the desired position do not forcefully move the arm and ball position without loosening as this can cause damage to the gearbox assembly. 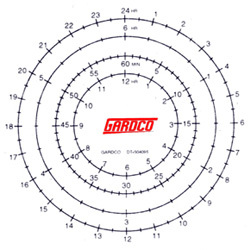 Apply the coating to your test panel using a Gardco Microm Film Applicator or equivalent wet film applicator. Set the arm to equilibrium by adjusting the rear counterweight before placing the brass weight on the ball shaft. Immediately place the Drying Time Recorder on your test panel and lower the clean 3/8 in. weighted Teflon stylus gently into position. Select the desired drying time and the stylus will then begin to be drawn along the test panel. 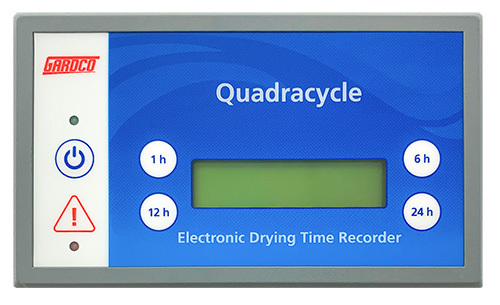 After the selected time cycle is complete the Drying time recorder will automatically stop. Evaluate the test panel using the supplied Time Template to determine the stages of drying time. Place the clear Time Template over the circular area scribed by stylus and note appropriate scale number of minutes or hours required for the film to cure, the character of the track by the 3/8 inch Teflon ball stylus relate to the drying of the film (Reference ASTM D5895). Record the results and if desired, record the temperature, humidity and the wet film thickness as these factors are important in considering the drying time of films. This unit will operate in temperatures from 32°F to 120°F (0-50°C), 5-95% humidity (no condensing) however, it is not recommended for oven use. For oven use, the GARDCO Spring Motor Drive Drying Time Recorder should be considered. Press to turn the Quadracycle On or Off. When the On/Off button is pressed and the Green LED is energized the instrument is ready for testing. If the On/Off button is held down for two seconds while the instrument is testing the current test will be terminated and the Red LED will energize. When the Green LED is energized the Quadracycle is ready for testing. Select the desired test time by depressing one of the four time cycles. Testing will start immediately after depressing the selected cycle. The time selected and "Testing" will be displayed on the LCD. The Quadracycle will stop upon completion of the selected time cycle and display "Test Complete" on the LCD. If there is a power interruption the Red LED will energize and the LCD will display "Test Interrupted". To reset depress the On/Off Button.